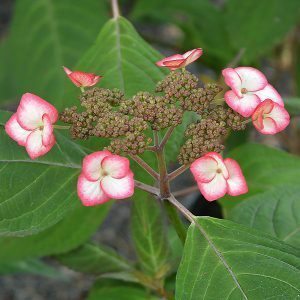 If you are looking for something a little different in an Hydrangea, then Hydrangea serrata ‘Kiyosumi sawa’ could be the one. This is a rare, and very attractive smaller growing variety. Hydrangea serrata ‘Kiyosumi sawa’ is best described as a compact bushy shrub with deep green foliage, veined and with burgundy flushes. The flowers are a lace cape type, and a little different to others. The new flower buds are a deepish pink, the flower as they open are picoteed, white with pink to red margins. Over time Hydrangea serrata ‘Kiyosumi sawa’ will generally reach around 1 metre or less in height and is is easily pruned to size. The flowers have a delicate structure and the plant lends itself to a quite shaded position in the garden where the simple beauty can be appreciated. Best grown in a humus rich well drained soil in a lightly shaded position. In warmer climates more shade, and extra water may be required in summer. Mulch around the plant each spring to help maintain a cool moist root run. Th plant is named after Mt Kiyosumi in Japan where it was discovered.